Each month, I will be sharing a keyword (one might choose to call it a “Core Desired Feeling”) to inspire you. This is the energy I am intending to hold for the month. I’ve written weekly tarot readings for more than a year now and every time I pull cards, it feels like I’m doing a reading for myself and not for my followers. Then I post it and I see everyone’s comments about how relevant these readings are. I see how many people are in energetically similar situations to my own. I’ve come to see exactly how connected we all are. We experience the world in different ways but in the end, we really aren’t that different. I’m hoping that by sharing by energetic goals, some of you will find a comfort in knowing you are not alone and that there is someone else out there, attempting to be the best version of themselves. I understand my views are not for everyone but, it is my ultimate goal to provide a sacred space to those who need it. I am always ready for open dialogue but not for judgment. If you feel the urge to judge me, or anyone else who may comment, I kindly ask that you don’t. Respect the voices of others, take what you need from my voice, and leave the rest behind. What I feel in the air: 2017 is nearly at its end and many of us are in a much better place now than we were at the start of the year; but also feeling confused about where things are headed for us. And yet, there is so much clarity at the same time. We’ve transcended to a new way of being. A new world where we can no longer ignore our discomfort or our thirst to follow our hearts. You may be working towards a goal and perhaps it isn’t working out the way you wanted, but you know you can’t give up. When I write things for you, I find myself speaking to you as though you are an entrepreneur. Of course I know that path isn’t for everything in the true sense of the word but, are you not the boss of your own life? Aren’t you the one who’s ultimately responsible for how smoothly your life’s vision goes? Aren’t you the one who has the final say about what you want or don’t want and who should occupy a seat on your board of directors? We are all THE BOSS in one way or another, some more than others sure but make no mistake, you ARE IN CHARGE of your life. In the back of my mind, I speak to you as an entrepreneur because I know how capable you are. I know you have a plan for your life and I know that you have the power to create whichever life you choose. Whether it’s building a Fortune 500 company from scratch or being the best stay at home parent on the block. I know you CAN do and EXCEL at any goal you wish to tackle. But I also know how hard it can be to trust in the Universe when you don’t have a clear plan of action. If you’re anything like me, you like to be in control and to know every twist and turn before getting on the highway. You want controlled risk and while you don’t expect things to be easy, you do expect things to work out the way you’ve perfectly crafted it in your mind. I bet when you saw the keyword above, you assumed I’d talk about some drastic sort of life transformation. That has been the running theme in the spiritual circles for a while. But I want to talk about transformation deep within. 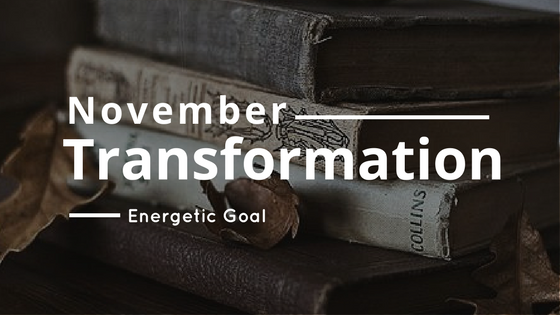 The type of transformation that isn’t obvious and the type of transformation that the energy of Scorpio, the ruler of this month is known for. It’s the sort of transformation that’s taking place under the surface. It’s the kind of shift that stays with you for the rest of your life. I want you to transform how you see yourself and how you see your world. Sure I can tell you to be positive all the time… “love and light” but I’m not going to do that. I’m asking you to step fully into your role of CEO of YOUR LIFE ENTERPRISES. Imagine your world is a corporation. What would that look like? How would it feel to be the one calling the shots? How would it feel to be seen as a leader who comes up with brilliant ideas? How would it feel to be praised for your efforts? Of course, the downside to be the one calling the shots is that you also have to take responsibility for when things go wrong. You have to be the one to carry the burden of YOUR LIFE ENTERPRISE's mistakes. You could throw someone else under the bus but it won’t change anything; you’re still responsible for whatever product YOUR LIFE ENTERPRISES puts out. I’m asking you to see your life from this perspective because you cannot see outer transformation until you find inner transformation. You cannot find inner transformation until you accept where you are currently. You do this by becoming the CEO who takes responsibility. You have to stop blaming the people, situations and definitely stop blaming the Universe every time things didn’t work out the way you’ve hoped. The Law of Attraction has essentially become a ‘get rich quick’ scheme where people are expecting dramatic change overnight. Yet so few people actually know how to use LOA because they don’t believe they can shape their lives. Sure you might know the lingo, say your affirmations and smile but do you really believe you have the power to have the life you want? Do you really believe you can go from $0 to $1,000,000 in a year? Find your soulmate? Go on that dream vacation or buy the big house? Let’s go deeper still. Do you believe your life is an outwards expression of your thoughts and feelings? Do you believe everything that has happened to you has happened because of you? I didn’t think so. You’re probably reading this thinking so and so broke your heart, “how is that my fault?” or that someone beat you to your grand idea, “How can I blame myself for that?” It’s simply, YOU ATTRACT YOUR THOUGHTS AND YOUR FEELINGS! I hate to be the one to break it to you but that also means you attract the bad stuff too. You’ve attracted every situation you’ve ever had in your life. Now I know that’s hard to hear, and I know it’s hard to take responsibility for that. It wasn’t easy for me either but I can say from my experience and from that of thousands of others I spoken to about this… You cannot use the LOA to transform your life until you transform your beliefs about just how capable you are. 2017 is nearly at it’s end and while you may not know where you’re headed, I believe you’ve made your way to this post because you are ready to take responsibility for your life. I believe you desire to step fully into your role as CEO and all the perks/consequences that comes with that awareness. The only difference between you and a hot shot CEO is that they believed they could and so they did. Will you believe in your power to have what you desire? Can you take responsibility and stop making excuses for why the LOA isn’t working for you? If you can, if you can transform your mind’s inner landscape, your outer world will follow. I hear your whisper of fall but I'm tethered to summer. But powerful rays of the sun won't let me go. Let my soul set far beyond the waves of the west. For I am not afraid of darkness. The Silent distance of fall in September. Flames built in summer there is much to remember. But shadows have powers to feed me. Have no fear, I will see you again. But right now it is Autumn who needs me.